I just added more info and photos on Portland’s 1948 Vanport Flood to the book, because the original G.I. Joe’s was in the flood area, and it is a rather forgotten part of Oregon history. Plus new facts about the early timeline for G.I. Joe’s is now included. I am grateful to Tom Robinson of the Historic Photo Archive for the photos and store history facts. If you are ever researching Portland or Oregon history, Tom is an incredible resource! Meanwhile, back at the computer, I am on, what I hope (!) is the final read through of the manuscript before it goes to the copy editor one last time! Then, it will be on to the design and printing part of getting Growing Up With G.I. Joe’s in bookstores. When I have a timeline for that, I will let you know. For fun, I have included a photo of G.I. 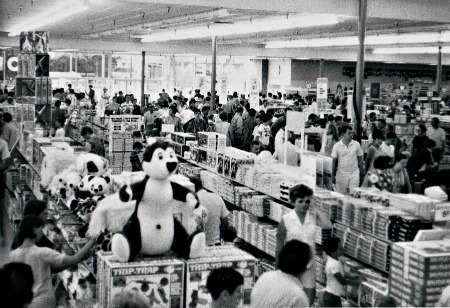 Joe’s Toyland in North Portland at Christmas time, probably in the late 1960s. For some reason your posts have been coming from my pastor’s blog titled 2 the source. I’m looking forward the the book.